Large house bank (five 200 A-hr AGMS), plus AGM start battery and AGM bow thruster/windlass battery. Total LOA with dinghy stored on davits 43'. Without the dinghy 40'6". Hinged radar mast allows bridge clearance to be reduced to 13' (if flybridge enclosure is disassembled -- it would be about 16' with flybridge enclosure in place). This boat has the extended keel to improve tracking, first introduced on this model in 2015. Decks, cabin sides, and pilothouse roof are heavily laminated FRP and cored with PVC foam. Interior floors are marine plywood laid on aluminum joists, and topped with solid teak and holly strips. Extensive sound attenuation methods and materials surround the engineroom. Interior varnishing is hand-brushed and hand-sanded two-part poylurethane applied in multiple layers for toughness and longevity, and topped with a final two-part satin spray coat. Many hours of labor are involved to achieve this level of long-lasting beauty. Board from astern via a large swim platform though the transom door. The cockpit is large enough for several deck chairs, and is sheltered by a hardtop cover. Thoughtful design includes anti-drip edges and stainless steel drain spouts on the upper deck to reduce rainwater draining into the cockpit. The lazarette below the cockpit provides a large storage volume. Hawsecleats make for convenient and unobtrusive attachment of mooring lines. The dinghy is mounted to the swim platform, and is easily deployed or stored using a Dinghy Dump'r davit system. The sturdily-built wide sliding aft cabin door provides entry to the full-beam saloon, which is much larger than would be expected in a boat this size, and is surrounded by large, opening windows for light and ventilation. The teak construction is beautifully done and makes for an attractive, nautical interior. Wood blinds provide privacy and add to the beauty. The galley features granite countertops, a 9 cu. ft. Nova Kool refrigerator/freezer, and a Force 10 propane range. Above the galley is a drop-down cabinet for galley storage, with a second drop-down storage cabinet aft of the galley. Also aft of the galley is a place for a comfortable chair or recliner. The dining settee has a high/low table that converts to a cocktail table, and the settee will make into a queen-sized berth. A day head, with shower capability, is immediately forward and convenient to the salon. Upholstery throughout is high-quality synthetic leather. The pilothouse is just two steps up from the salon and integrated into the living spaces. The L-shaped dinette allows three or four guests to enjoy the pilothouse while underway. A conversion option creates a single berth or additional seating when needed. The helm station is to starboard, and features a sliding helm chair with fold-up bolster for leaning if desired. Forward visibility from the helm station is excellent, and because of the low pilothouse design it's possible to view the aft quarters directly from the helm seat also (unusual in a pilothouse model). Sliding pilothouse doors port and starboard allow easy access to the dock, the foredeck or to the flybridge. Ventilation is provided by an opening forward window, opening side windows, and an overhead hatch, in addition to the sliding doors. The master cabin has a queen bed, a hanging locker to starboard, a large locker with custom shelves to port, storage drawers, two storage cabinets, bookshelves, and separate head and shower compartments. Light and ventilation is from two opening portlights and an overhead hatch. Both heads use Dometic Masterflush macerating-style toilets. The flybridge has two pedestal seats and an L-shaped settee. As with the entire exterior of the boat, the design of the flybridge is uncluttered and intended to be simple to maintain and easy to clean. There is a complete enclosure for the flybridge.The top deck and the stairs to the flybridge have side curtains for safety. Cabin heat is a Webasto forced-air diesel-fired furnace. The upper helm is not equipped with Multi-Function Display (MFD) because the Garmin equipment provides a bluetooth connection so that an iPad can replicate the capabilities of the lower helm MFD. heating, upgraded engine, and bow and stern thrusters. Standard design features of the model include an amazingly spacious and inviting salon with a day head immediately accessible, separate master head and shower compartments, and an extended pilothouse that serves as a living and dining area in addition to its piloting function. This is a very roomy and comfortable boat, frequently mistaken as being much loarger than it is, yet fits in a 40 foot slip. Its 380 hp electronically-controlled Cummins QSB6.7 common-rail engine turns down nicely, and operates smoothly and quietly. She performs frugally at 7 or 8 knots, and has additional power when needed. A new Helmsman Trawlers 38 would require 6-9 months to build -- this later model example is available now, appears in excellent condition, is well-equipped and is offered at a lower price. Excluded from the sale are the recliner (shown in some photos, but you'll want your own comfortable chair anyway), decorative rugs and pillows and the small trawler lamp. 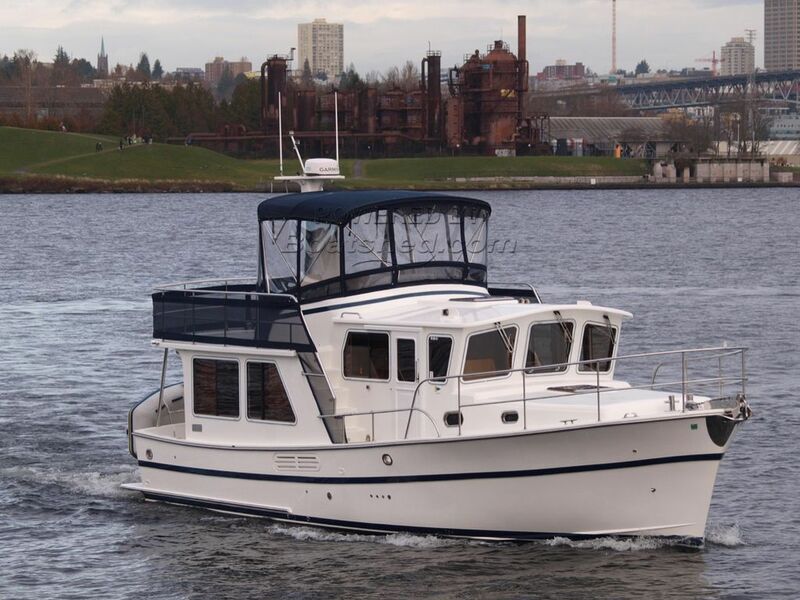 This Helmsman Trawlers 38 Pilothouse Flybridge Trawler has been personally photographed and viewed by Scott Helker of Boatshed Seattle. Click here for contact details.